This dish wasn't supposed to be high maintenance. Boasting a reasonable number of ingredients and a very simple cooking method, it was supposed to come together with ease. And yet, somehow, the grocery shopping for it turned into the ultimate treasure hunt. With two Asian grocery stores mere miles from my house and a Whole Foods just a little further down the way, I would have never imagined how much effort I would have to put into finding one solitary ingredient: kaffir lime leaves. Ultimately, they became my Holy Grail, my pot of gold at the end of the rainbow. And after visiting four stores and calling three others? Success! Victory is sweet indeed...or, in this case, curry-flavored. So was the craziness worth it? Absolutely. Balancing the sweetness of the coconut milk with the saltiness of the fish sauce and the lovely spice of the red curry paste, I have no doubt that those little leaves made the dish. ;-) Could I have simply skipped that one ingredient? Probably. But I wanted authentic, people! And after tasting the finished product, and can assure you: I would do it all again. Note: this dish was made as a contribution to ONE's ongoing sweet potato campaign. Be sure to check out their tumblr. 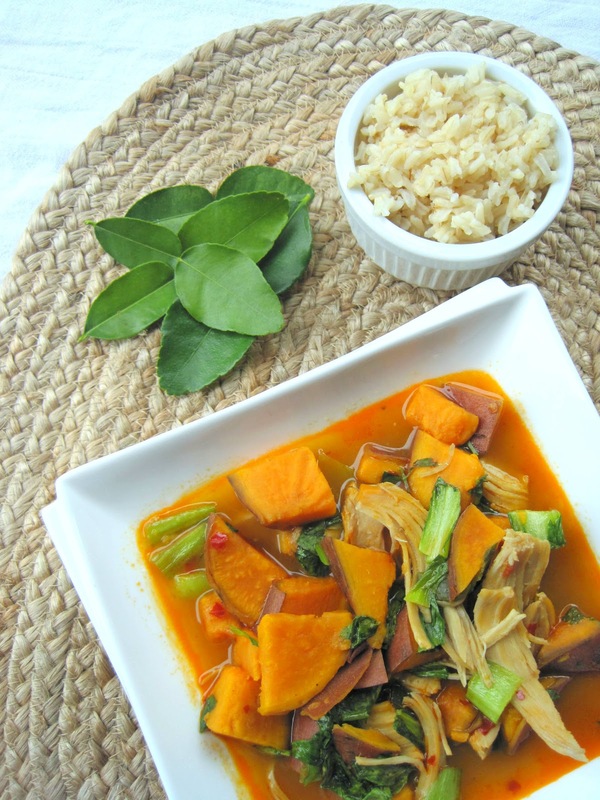 Combine coconut milk and red curry paste in a wok or deep saucepan. Stir well to combine and bring to a boil over high heat. Reduce heat to medium and add sweet potato, simmering for 10 minutes or until slightly tender. Add 1 cup of stock, sugar, fish sauce, chicken, lime leaves, and pepper. Stir together and continue to simmer for an additional 10 minutes or until the sweet potato is fork-tender. Add the baby bok choy and cilantro and reduce heat to medium-low, simmering for 3-4 minutes or until greens are wilted. Adjust taste and thickness as desired by adding up to a cup of additional stock. Serve over rice with optional toppings. Fixit when any appliances or vehicles give problems.